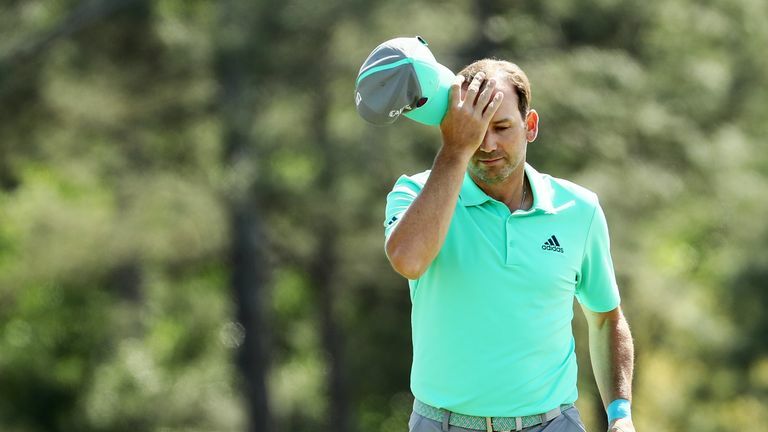 We thought Sergio Garcia's dark days were over when he won the Masters. When that long-awaited major title became a prelude to Sergio getting married and becoming a dad, we assumed we'd seen the last of his petulance and bad behaviour. But his damage to the putting surfaces of the Royal Greens Golf Club in Saudi Arabia has mired him deeper in notoriety than ever, the first player to be disqualified for serious misconduct on the European Tour. Outside observers will, no doubt, be asking why all the fuss about a bit of grass when the real issue is whether a professional golf tournament should be taking place in Saudi Arabia at all. It's a fair point and one that will surely be further discussed in time to come. However, within the narrower confines of sport, a player of Garcia's stature being kicked out of a golf tournament is significant. In this case, it calls into question any further punishment and also the future relationship between the player and the European Tour. Garcia is one of a group of international superstars with whom the Tour has to walk on eggshells in order to maintain their commitment to European events and the Ryder Cup. Maybe that's the reason everything is now being downplayed. Some of the players who originally reported Garcia's misconduct are saying it didn't amount to much and the Tour say the matter's been dealt, end of story. If that's the case, why take the unprecedented step of disqualifying him for serious misconduct in the first place? For the rest of us, there's a lingering concern. For a start, the act of deliberately damaging a putting surface that was lovingly and laboriously prepared by a person earning a modest wage is something approaching sacrilege in sport. It leaves Sergio wide open to the kind of criticism that we know hurts him and it leaves those of us who like him dismayed and discouraged. By all accounts, he was being paid handsomely to take part in the Saudi International but his demeanour during the tournament was negative in the extreme. He had a disturbing tantrum in a bunker on Friday which rang all kinds of anger management alarm bells. He thrashed his club repeatedly in the sand and ranted in both English and Spanish, the gist of which was: "What a week!…"
Not for the first time, Sergio became "Poor Sergio". The rest of us thought 'here we go again', and it was not a huge surprise to hear of his denouement on Saturday. Sergio has crossed the line many times in the past but his more attractive alter ego has always been able to somehow rescue the situation. This time, his unconvincing, possibly even grudging, apology may not do the trick. To regain the popularity and standing in the game I think he deserves he will have to show the kind of contrition that demonstrates an understanding of himself. Sergio Garcia has lived a gilded life but time and again he's painted himself as a victim of unlucky circumstance. The smiling, exuberant kid we all remember from his high-kicking run at Medinah in the 1999 USPGA championship became an all too often scowling, whiny pain in the neck. The act of deliberately damaging a putting surface is something approaching sacrilege in sport. It leaves Sergio wide open to the kind of criticism that we know hurts him and it leaves those of us who like him dismayed and discouraged. Believe me, it's hard to write words of condemnation about a someone you like and admire. He's never been anything but charming to me so it's difficult to address his dark side. When he lashed out violently, kicking a shoe at Wentworth only two months after that Medinah magic in 1999, he said: "It's not something I should be showing children…but I'm not doing this every day." When he spat in the cup at Doral in 2007 after missing a short putt he said very little. After all what could he say? And when he lost out to Padraig Harrington at the PGA Championship in 2008, he privately said some of the most bitter words I've ever heard. Sadly, this litany of bad behaviour continued for years to come. On countless occasions, top players grumbled about Sergio's behaviour during tournament play. One squared up to him at the end of a round and warned him never to act like that again…or else! Strangely enough, the greatest outcry and biggest controversy involving Sergio arose from innocent stupidity rather than any malevolence. Sergio's world caved in when he made an off-the-cuff reply about his old nemesis Tiger Woods. During an interview at a European Tour dinner at Wentworth in 2013, he light-heartedly suggested he'd be inviting Tiger round to his rented accommodation at the Masters and serving fried chicken. He obviously didn't know that fried chicken is a lightning rod for racial tension in the USA but he soon found this out to his cost. He maintained he was not a racist but that didn't wash with his outraged critics. I remember sitting with him on a golf buggy outside the Media Centre at Wentworth the day after his comment. He was distraught and disorientated. I tried to calm him down by reasoning with him. "How does a kid from Spain come to know he's scoring some kind of cheap point over a black American by talking about fried chicken," I asked. The answer, of course, was from casual trash talk with fellow golfers on the PGA Tour, the very ones who were loathe to come to Sergio's defence. I believe he genuinely did not understand the depth of offence in a remark he'd heard in the context of jokey conversation. Whatever he thought, the unsavoury episode almost brought his career as he knew it to an end. His major sponsors considered dropping him and his stock in the world of golf was at an all-time low. Sergio Garcia hurled his driver into the bushes during the second round of the Valero Texas Open. Somehow, though, he recovered and, four years on, he discovered his holy grail at Augusta National, despite having said despairingly at the same place five years earlier: "Maybe I'm just not cut out to be a major champion." Most of us feel a key element of his eventual success was his then girlfriend, now wife, Angela Akins. She appeared to instil in Sergio a new self-belief and contentment, bringing to an end many years of apparently unhappy relationships. The arrival of their daughter Azalea seemed sure to complete Garcia's sense of gratitude and happiness. And maybe it has. Maybe what's just happened is an isolated incident. Maybe he just didn't want to be in Saudi Arabia. And there's the rub. Because the irony here is that the more jingoistic social media warriors may already be claiming Sergio as some kind of comic champion in their campaign of moral opposition to Saudi Arabia. That, of course, would be ludicrous, because whatever they think is wrong with that vast, oil-rich country, doesn't make it right for a talented and likeable young golfer to be miserable at his work and unable to count his blessings.